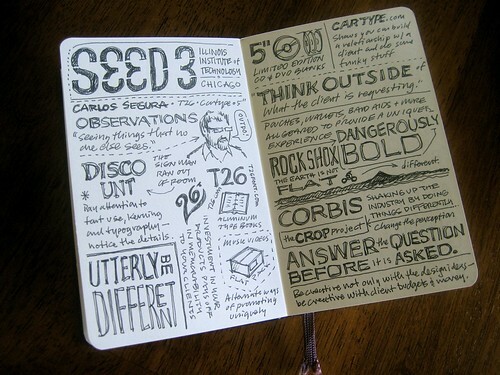 I wanted to pass along word that all 26 pages of my SEED 3 sketchnotes are now posted on Flickr, so please go check them out and leave comments if you like. I will replace this post with something of more substance in a day or two. I sat next to you for a few of the sessions and have to admit that I was enraptured by your sketching. In MOST cases it was more entertaining to stare at your pages rather than the projected slides. As for Moleskines -- do check out the sketchbooks, They have much thicker paper than can handle lots of ink coverage. @Jeff Thanks man! I kind of get into a zone when I do sketchnoting, so I've wondered if people are watching. It doesn't bug me to have others watch at all, it's kinda cool actually. Sat next to you during most of the conference and watched (in amazement) these sketches come to life. Fabulous work and thanks for posting! Thanks for hanging with me at the conference and riding the EL back to Union Station, it was great fun!